Un cazacarros basado en el T23. El desarrollo comenzó en 1943. Como el T23 no entró en servicio, tampoco se siguió trabajando en el cazacarros. Solo existió en forma de planos. Good for hull down, thanks to its small turret and relatively low hull. 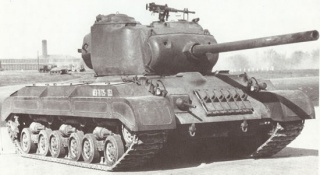 It is important not to think of this tank as a progression from the Hellcat, but rather as a larger Jackson as the TD plays much more like the slower Jackson than the speedy Hellcat . Its highest gun is adequate for its own tier, though it is rare to be at the top of the list. It is best to use this as a second line tank, sniping at already engaged tanks or hitting them from out of their range before relocating. The depression of its guns is excellent, allowing you to make shots that most opponents wouldn't expect, especially if you are on higher or lower ground, and can save you from some difficult encounters. It is imperative to aim for the weak spots on opponents, and avoid fighting alone or spearheading an attack. The T15E2 gun has good penetration for its tier. If possible, try to remain undetected whilst killing off low-health targets. If detected, use it's speed to relocate before taking too much damage. Coming from the M18 Hellcat the T25/2 may seem like a let-down, especially when it is stock but in the right hands it can be an excellent tank. Esta página se ha visitado 16 veces.